Vachères is a typical village in Haute Provence situated in the middle of a well-preserved natural environment of extraordinary beauty : from the highest point of the village (910 m) you can look out over 7 departments !!! The old village has been constructed in harmony with the environment and carefully restored with local material. You can happily wander around the paved streets of Vachères, and you will come across beautiful stone houses, a tastefully renovated priory and covered archways that add much character to the village. 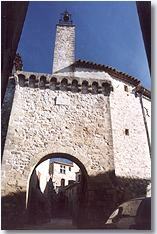 A series of small roads lead you to the "gorges d' Oppedette to the"Colorado provençal" and towards Rustrel. By taking the road to Banon you will come across a beautiful Provencal bastide with three towers (known as the château) then 500 metres further, you will discover a small church of Roman origin set in a charming, shady spot. The Monday morning market at Forcalquier will soon become a ritual that you will not want to miss as it is one of the most beautiful markets in Provence along with the ones held at d'Apt and Manosque(Saturday morning). Calm, tranquillity and wide open spaces... Vachères is a village where you can come to rest, to walk a little and relax. You won't find a golf-course, a luxury hotel, night club or bustling shopping centre but you will discover the local "épicerie" or delicatessen and you will meet the cafe owner and other local people keen to preserve their way of life and the delightful atmosphere that reigns at Vachères. 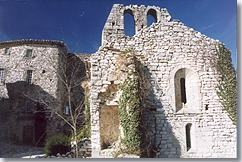 Ruins of "la chapelle St Christophe" and the chateau-fort. "Plateau des Moulins": ruins of the windmill and panoramic view. 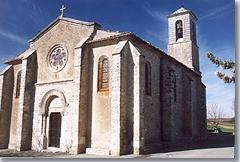 Roman church "Notre Dame de Bellevue". Summer festivals: antique fair, village festival mid-August. Holiday rentals, Self-catering rural holiday accommodation.